Sound is produced by vibrating objects. In human beings, the vibration of the vocal cords produces sound. It sends the signals to the brain. This process is called hearing. The number of oscillations or vibrations per second is called the frequency of oscillation. Larger the amplitude of vibration, louder is the sound. Higher the frequency of vibration, the higher is the pitch, and shriller is the sound. Excessive or unwanted sounds lead to noise pollution. Noise pollution may pose health problems for human beings. Attempts should be made to minimise noise pollution. Plantation on the roadside and elsewhere can reduce noise pollution. Answer : d. solids, liquids and gases. Question 2. Which of the following voices is likely to have minimum frequency? Question 4. Fill in the blanks with suitable words. ((e) Shrillness of a sound is determined by the ................. of vibration. ((e) Shrillness of a sound is determined by the Frequency of vibration. Question 5. A pendulum oscillates 40 times in 4 seconds. Find its time period and frequency. We know that the number of oscillations per second is called the frequency of oscillation. Question 6. The sound from a mosquito is produced when it vibrates its wings at an average rate of 500 vibrations per second. What is the time period of the vibration? Question 8. What is the difference between noise and music? Can music become noise sometimes? Question 9. List sources of noise pollution in your surroundings. List sources of noise pollution in your surroundings. Question 10. Explain in what way noise pollution is harmful to humans. (5.) Temporary or even permanent impairment of hearing. Question 11. Your parents are going to buy a house. They have been offered one on the roadside and another three lanes away from the roadside. Which house would you suggest your parents should buy? Explain your answer. Question 12. Sketch larynx and explain its function in your own words. 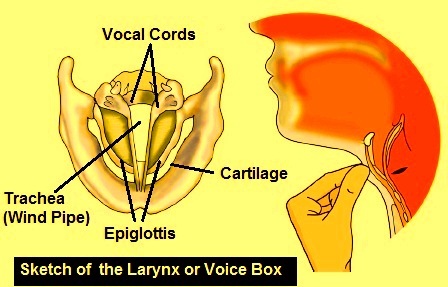 In humans, the sound is produced by the voice box or the larynx. It is a hard bump like structure deep inside the throat, located at the upper end of the windpipe. Two vocal cords, are stretched across the voice box or larynx in such a way that it leaves a narrow slit between them for the passage of air. Question 13. Lightning and thunder take place in the sky at the same time and at the same distance from us. Lightning is seen earlier and thunder is heard later. Can you explain? Answer : The light travels at a speed of 300000000 m/s where as sound travels at a speed of 340 m/s.